Peruvian cuisine is known for their bold flavors and exotic ingredients. Plates of lomo saltado and ceviche lure in the adventurous eater and entice the palette. 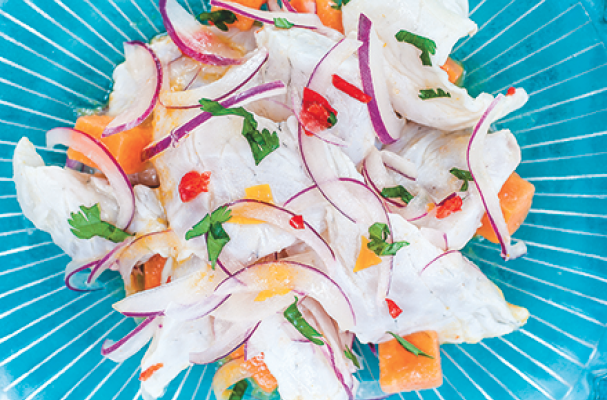 Ceviche: Peruvian Kitchen by Martin Morales is the first authoritative cookbook to share Peru's culinary traditions with an US audience. Morales features over a hundred recipes including tiraditos (plates of raw fish similar to Japanese sashimi), popular street foods, quinoa salads, desserts, cocktails and more. The cookbook also contains information on Peruvian ingredients and where to find them. Ceviche: Peruvian Kitchen will coax your culinary curiosity and whet your appetite for the delicious dishes of Peru. This is our signature dish, so-called as it’s really the daddy of all our ceviches and the most popular dish we serve at Ceviche. We suggest sea bass for this recipe, but use whatever firm-textured white fish is freshest at the market. Rinse the onion and then leave it to soak in iced water for 10 minutes. Drain thoroughly, spread out on a paper towel or a clean kitchen towel to remove any excess water and then place in the fridge until needed. This will reduce the strength of the onion and help to keep the slices crisp. Cut the fish into uniform strips of around 11/4 by 3/4 inch / 3 by 2 cm. Place in a large bowl, add a good pinch of salt, and mix together gently with a metal spoon. The salt will help open the fish’s pores. Leave this for 2 minutes and then pour over the tiger’s milk and combine gently with the spoon. Leave the fish to “cook” in this marinade for 2 minutes. Add the onion, cilantro, chile, and sweet potato to the fish. Mix together gently with the spoon and taste to check that the balance of salt, sour, and chile is to your liking. Divide among serving bowls and serve immediately. NOTES: Keep your fish refrigerated until just before using. We recommend using fine sea salt for making any kind of ceviche, as it is higher quality than other salts and more beneficial in cold “cooking.” With any other kind of cooking with heat, regular table salt is sufficient. This is our classic tiger’s milk. It is probably the most versatile and the one we use most often at Ceviche. Put a 1/4-inch / 5-mm piece of fresh ginger (cut in half), 1 small clove garlic (cut in half), 4 roughly chopped cilantro sprigs, and the juice of 8 limes in a bowl. Stir and then leave to infuse for 5 minutes. Strain the mixture through a sieve into another bowl. Add 1/2 teaspoon salt and 2 teaspoons amarillo chile paste and mix well. This will keep for 4 hours in the fridge. Reprinted with permission from Ceviche: Peruvian Kitchen by Martin Morales (Ten Speed Press, © 2014). Photo credit: Paul Winch-Furness.